A recent family trip to Cape Point Nature Reserve nearly ended in disaster, simply because we didn’t know what to do when we had car trouble. So I thought that I would write a post so that in a similar situation you can avoid the same problems. My sister visited me recently. It was her first visit to Cape Town and so naturally we were keen to show her all the great places in the area. Before she had even had chance to unpack we were whisking her off to Cape Point, via Boulders to see the penguins. She is a wild life nut so the penguins were a big hit at Boulders, plus we saw a family of mongoose playing under a tree. 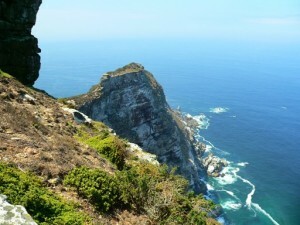 Then it was off to Cape Point, and what a perfect day it was: sunshine, warm, no wind but not baking. We climbed to the top and did all the photo shoots, then came back down and did some more photography, had lunch at the restaurant (my daughter fed the mice), watched the buck for a while and then returned to the car. The idea was to drive down to the Cape Of Good Hope to see if the ostrich and zebra were there. This is where our tale takes a turn for the worse. The car started ok, we pulled out of the parking, started off down the road, the alarm went off, the brakes and steering seized up and the engine cut out- immobilized! No amount of pressing buttons could get it to stop. I pulled off to the side of the road and did the usual thing, open the bonnet and stand there poking and prodding bits and pieces, with no real clue what is going on: I can drive a car but there might as well be fairies and pixies making it go. All this time the alarm is blaring out. I had no clue but luckily I am a member of the AA and so I gave them a call and after explaining very carefully where I was (not having a street name to give them throws them off completely) a mechanic was dispatched. This was where I discovered the biggest design flaw ever with our little car- all the doors will lock manually with a key, except the boot! So the family went back to the café, whilst I sat guard over the car. People are not kind! I was sat a way from the car, mainly because of the noise- the comments were vicious (especially in German- never assume that those around you cannot understand foreign languages), basically ‘which idiot left their car alarm on’ was a kind a clean sum of what was said. No body helped though! Eventually (the AA man had a long way to go) I got a phone call from the mechanic- I had to phone a number and say who I was and why the AA man needed entry to the park, otherwise they wouldn’t let him in. So I phoned the number only to be told off for not reporting that we had car trouble to a park guard (apparently car gods don’t count.) After much discussion a guard was dispatched to check out the claim that an alarm was indeed going off incessantly (nearly an hour now), he radioed that all was above board and the AA man was let in. Lesson 1: If you have car trouble in a park you need to report it immediately to SANParks, either through the number on the entry gate (put it in your phones memory) or to one of the park guards. Not doing this held up our repair guy by at least 20 minutes, and as we will see later, time is important in these matters. Lesson 2: The Park closes at a certain time, but if the tow truck enters after 6.30pm it costs R400. Ouch! This is the main lesson that is to be learnt out of this debacle: How many people drive into a park and take no notice of the information board? It has all sorts of wonderful information on it, including all the relevant emergency numbers, which in this age of rampant cell phone proliferation is the easiest thing in the world to take note of. Further, SANParks run a fantastic website, again detailing all the information you will ever need, and I know first had that they are great at responding to emails (I got one back once from the head honcho, I only queried about seals in Kalk Bay). And yet we do not take the time of make a little effort to arm ourselves with information which could quite literally save your life (fall down a cliff in parts of the parks and see how long it takes for someone to happen by). Our parks are user friendly and give the appearance of being unbelievably safe, but they are still vast areas of land, mostly wild; the areas that have been tamed are small. There may not be dangerous predators in them but you should still not take them lightly. We were unprepared, and the implications were only inconvenience and financial, but it is a real eye opener to the blasé approach that we take to the national parks. I have learnt my lesson, enjoy them, but respect them, or Mother Nature might teach you that lesson. Many thanks to the wonderful people at the AA who once again were helpful, courteous and professional, got us home and gave advice on what to do next. For more information please click the banner ad below, the piece of mind it gives you is worth much more than you pay. Not only do they send a guy to sort out the problem, they will also send security if you request it, prioritize lone female drivers, and get you to where you need to be if they cannot fix it at the road side. They even sort you out if you have run out of petrol or don’t know how to change a tyre. An uncharacteristic commercial endorsement for CPC, but I believe in promoting businesses who I think are worth it. This entry was posted in General information, Places to visit, Traffic, Wildlife and tagged Cape Point Chronicle, Cape Point Nature Reserve, Cape Point Peninsula, cape town, Simon's town. Bookmark the permalink.